Step #1 - Start outside. 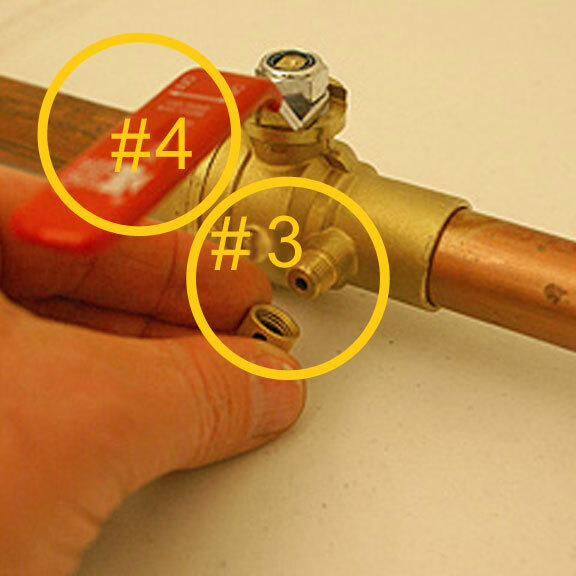 Turn off the manual drain valve inside your manifold box near your valves (this may either be brass or pvc - if pvc, the valve is off when the handle is perpendicular to the valve). Repeat for all valve box assemblies you may have. 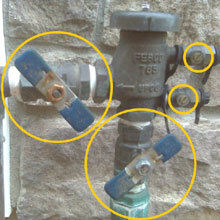 Step #2 - Close all valves on the backflow prevention device. Every handle and screw head should be perpendicular to the pipe. You will open the larger ball valves one at a time later on, but for this step, make sure everything is in the closed position. Step #3 - Inside the house -- Be sure to tighten the drain cap on the valve before pressurizing the system (#3). 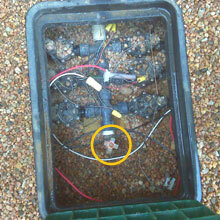 Slowly turn on the main valve to the irrigation system (#4) and listen carefully! You will hear water flowing through the pipe until the system pressurizes. Make sure the water stops flowing through the pipe after it pressurizes. If water does not stop, then you either did not close the valves on the outside properly , or you have a leak in your irrigation mainline. Step #4 - Go back outside. Leave the smaller screw heads closed. Follow the direction of water-flow and turn on each of the larger handles one at a time so they are parallel to the pipe. The first valve will pressurize the vaccuum breaker (you may see a small rush of water come out as it pressurizes... if the water doesn't stop coming out, then you may have a broken poppet and bonnet assembly typically due to freeze damage). 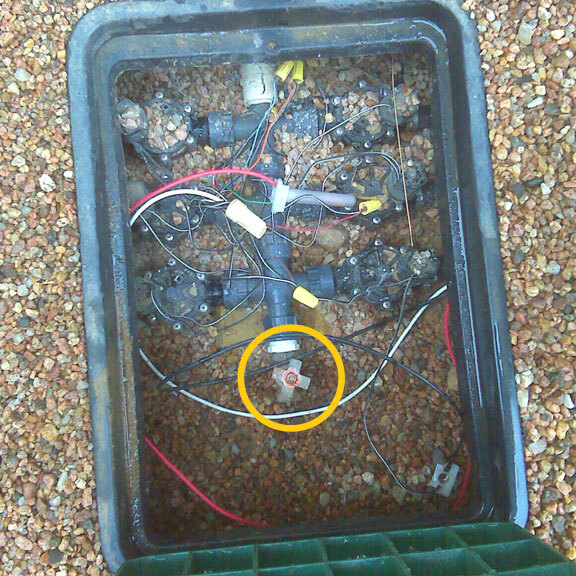 The second valve (please turn on slowly) will pressurize your irrigation system. Again, listen carefully and make sure the water stops flowing through the pipe once everything is pressurized! That's it. You can now cycle through your controller to make sure everything is working properly. 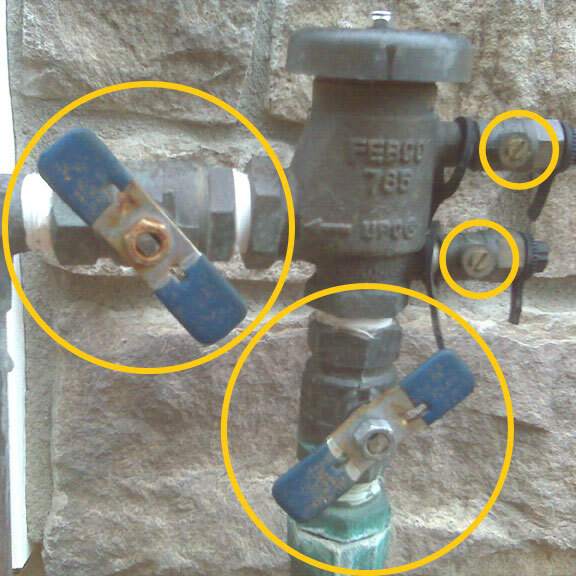 The process above is a general overview of how to turn on your sprinkler system. It does not apply to every sprinkler system and is not meant as a complete guide for every system. Should you encounter difficulty, or problems during any of these steps, please shut off the water inside your home, and call us or a plumber for help.